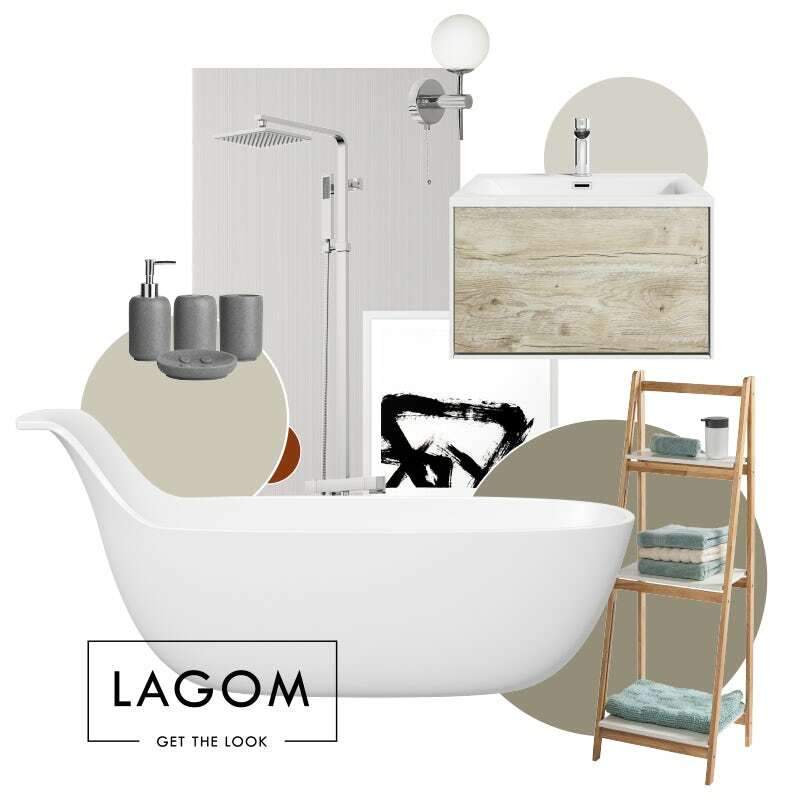 In my latest “Get the look” style guide, I’ll show you how to create the perfect Scandi style Lagom bathroom. 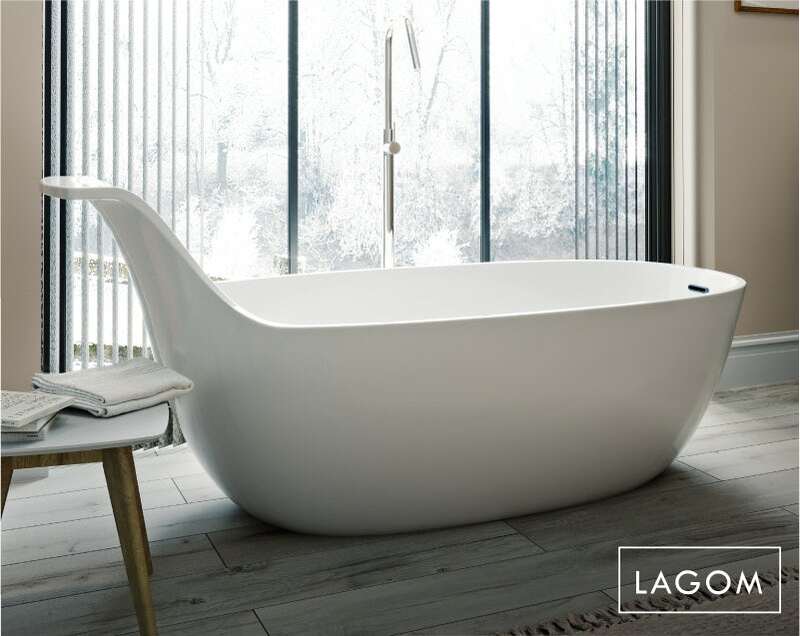 Following closely on the heels of the “Hygge” trend for warm and cosy interiors, “Lagom” is the next big Scandinavian-inspired craze to sweep the world of interior design. From a Swedish word which loosely translates as “just enough”, this new Scandi style is all about contemporary, minimalist design—perfect for those who appreciate the simple things that life can bring. When it comes to interior design, our Scandinavian cousins have really got things spot on. With a little help from a large, Swedish furniture store (which we won’t mention here! ), Scandinavian home furnishings have come to dominate the world, with Scandi style now a defined and popular look. Over the past few years, we’re all guilty of getting a little obsessed with “Hygge”—indeed, for a while, it was difficult to flick through a home interest magazine without seeing a Hygge lifestyle shoot, featuring roaring fires, mugs of hot chocolate, candles and chunky throws. However, the times they are a-changing! Comfortable modern living doesn’t have to mean owning multiple items and lavishly decorating your home. The Swedish proverb “Lagom är bäst” translates as “the right amount is best” and can be equated to the notion of “less is more”. It's a sentiment which perfectly describes this new interior design trend. Whilst Hygge design was appropriate for cold, winter nights, wrapped up and cosy in your home, Lagom is more of a lifestyle approach. It’s about consuming less and thinking about how we live our lives in a simpler fashion. But what does this mean when it comes to your interiors, and, more specifically, your bathroom? To help with your own inspiration, I've created my own Lagom mood board below. 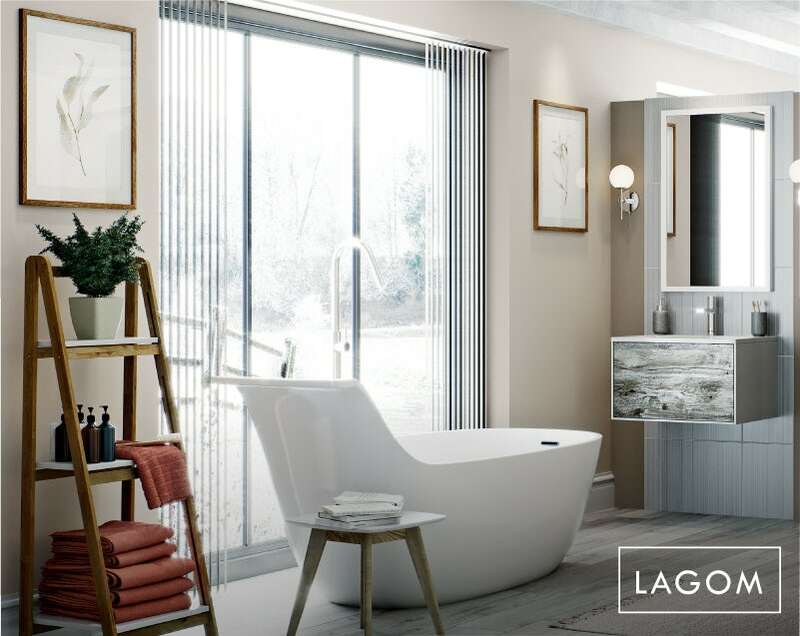 As with many busy family households, your current bathroom may seem a little cluttered, cramped and untidy, which is where a touch of Lagom could be just the antidote. It may mean ditching some of your favourite bathtime essentials but it could have a profound effect, not just on your space but on your approach to life. Choose warmer colours, such as browns, greys and ivory, to give your bathroom a peaceful yet inviting appearance. As the look is minimal, bright whites and cooler shades will feel too stark and cold, especially in winter months. For a more thoughtful and cohesive look, mix and match soft tones together. If you paint one solid colour it can look overwhelming and regimented. Select a bathroom suite and furniture with light curves for a smoother finish. Your bathroom should be a mindful space—an area which is both practical and relaxing, yet one which accommodates your needs. It shouldn’t be overwhelmed with accessories or items as you shouldn’t feel the need for multiple products. Sticking to “just the right amount” = “lagom”. Place your bath in front of a window to help you reflect and unwind. If you live in the countryside and have the luxury of privacy, you could even enjoy a relaxing view with a clear glass window. Slightly rustic elements help to add character, found in the vanity unit and the vinyl floor. Create a sense of nature by adding single or dual plant accessories to your mindful space. Plants are well known for the health benefits and mental cleansing, blurring the boundaries between outdoors and indoors. Minimalist style prints can be used as a way to decorate but not overpower your room. Simple lighting such as spotlights are perfect without creating a huge feature or unnecessary distraction. You can add extra lighting around your mirror for convenience. For a warm and comforting accent, introduce touches of rustic red or burnt terracotta. The colour will enhance the warmth within the room, adding a subtle yet colourful feature. Of course, we don’t all have bathrooms as large as the one pictured above. 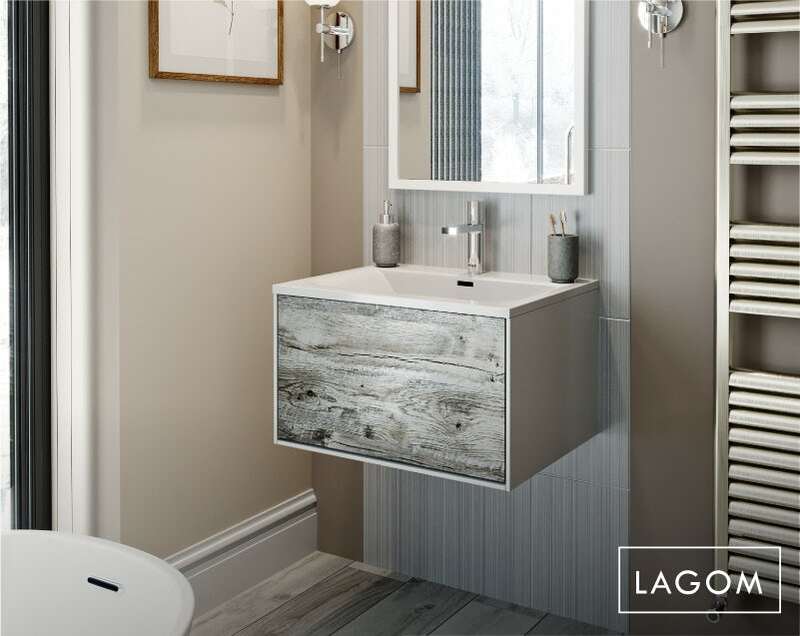 If you’re looking to add a touch of Scandi style Lagom to your average-sized bathroom, head to part 2 by clicking on the image below. 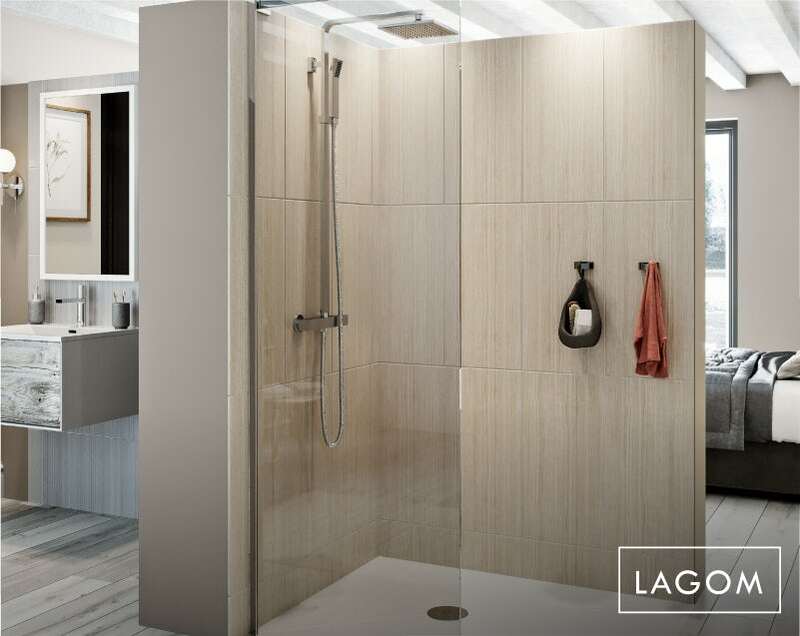 Get some Lagom in your life, even in a small bathroom, with these fabulous small bathroom ideas. The latest trend for spring/summer 2017, warm minimalism is all about keeping things simple yet inviting. We explore the warm minimalist look in greater detail.